KoopaTV: You Can Buy M Rated Games Digitally Underage on Nintendo, Plus Ace Attorney Sales and Demo! Maddie wasn't necessarily lying to Nintendo at this screen — she could've had a parent or guardian fill this out. If you have the payment methods to buy something from the Nintendo eShop applications on the Wii U or 3DS — a credit/debit card or a Nintendo eShop card (which we give out on KoopaTV as prizes for your loyalty to the site) — then you have the payment methods to buy something from Nintendo's site. And you should. Because if you haven't bought Phoenix Wright: Ace Attorney — Dual Destinies or Phoenix Wright: Ace Attorney Trilogy yet, it's time for yet another sale. The last sale was in May, and Dual Destinies was 50% off while Ace Attorney Trilogy was 40% off. HEY. KLAVIER. KLAVIER GAVIN. WHERE THE HELL DID YOUR DRUMMER GO? I NEED A DRUM ROLL. I EVEN SAID PLEASE. Until August 18, you can purchase these games — from your 3DS's eShop application or online — for $11.99 for Phoenix Wright: Ace Attorney — Dual Destinies and $16.49 for Phoenix Wright: Ace Attorney Trilogy! That's 60% off and 45% off, the most discounted these games have ever been! Will they get any lower? That's a dangerous game to play, so you might as well get them right now. As a bonus, the events of Phoenix Wright: Ace Attorney, included in the Phoenix Wright: Ace Attorney Trilogy compilation, are happening in real-time in 2016. You can't get much better than that, huh, Wright? Phoenix Wright: Ace Attorney — Spirit of Justice, the sequel to Phoenix Wright: Ace Attorney — Dual Destinies, will be released in North America this September 8. That is less than a month from now! Phoenix Wright: Ace Attorney — Spirit of Justice will have an eShop demo released on August 25th... less than two weeks from now! Don't know whether or not you want to try these games out to begin with? 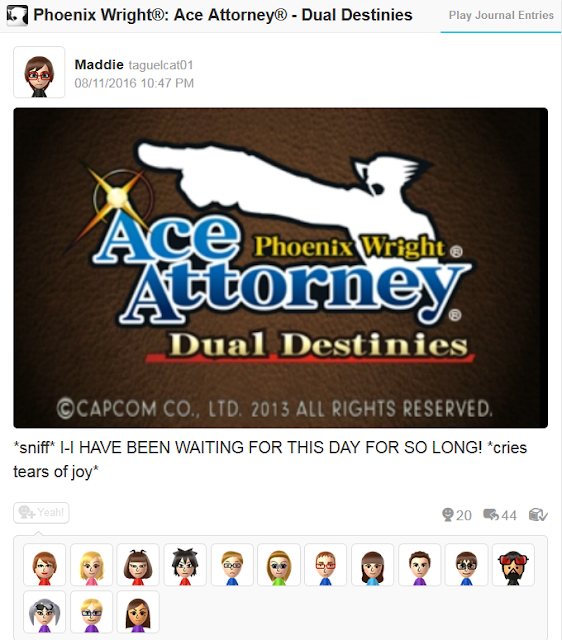 The Phoenix Wright: Ace Attorney — Dual Destinies eShop demo is still up. Download that. You'll love it. Then you'll want to buy the games on sale. It's the just thing to do. And then you'll know what I mean when I reference the series for things like the Dark Age of the Law. You'll also enjoy it for non-KoopaTV-referential reasons, of course. Guaranteed. Oh, and all of the other Ace Attorney games, including Spirit of Justice, are all rated T by the ESRB besides Dual Destinies. Ludwig and the entirety of KoopaTV's current staff all strongly endorse the Ace Attorney franchise. There's no better endorsement than that. Ludwig would normally write “in the meantime ...” in this footer, but that implies it's acceptable behaviour to hold off on playing the Ace Attorney series. Speaking of real-time, Joe Darke was out killing people in late 2014. Fortunately, he got arrested in early 2015... but not without killing another dude. Hillary Clinton tried to make buying M-rated games underaged totally illegal in America, along with a host of other industry-killing regulations. Don't vote for her. The demo has come out! How was it? You should get it. September 8 has arrived, and the game is released! You thought those discounts were good? How about Phoenix Wright: Ace Attorney Trilogy for 50% off... and Phoenix Wright: Ace Attorney — Spirit of Justice on sale, too? Three cheers for all this Ace Attorney news! You would think the other members of the band would at least be mentioned, if not outright brought to court as witnesses. ...Or you'd also think they would BE ON THE STAGE WHILE THE BAND IS PERFORMING. Yeah, what's listening to it one more time? 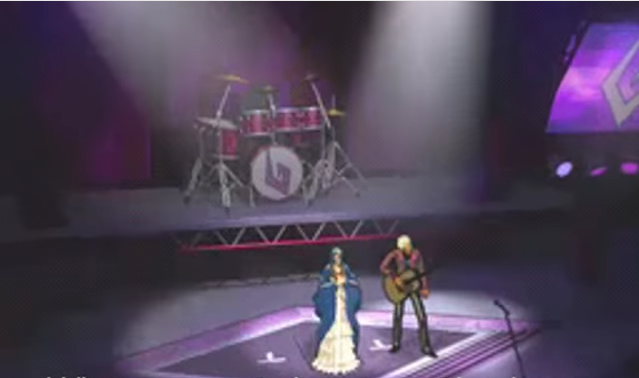 I wonder how many songs Guitar Serenade has beat out in terms of the number of times the song has played in an Apollo Justice playthrough. I'm not sure if a midget is effective as a drummer or as a cop, but this is 2026 and anti-discrimination laws must be even more protective than they are now! When Dual Destinies released, I thought it was odd that I was able to play the demo but not purchase the full game itself. Why would Nintendo tease me like that? 'cause they hate making money. The timing is great because then I could get this for my planned California trip. Not getting the demo dine I don't was to do the first case twice back to back.
" Not getting the demo dine I don't was to do the first case twice back to back." I don't want to redo the case so soon after already playing it. Well, the previous demos for the games didn't cover the whole case, and also were edited a bit.